Developed in partnership with Innovations Foresight, Optec's new Lacerta for Lodestar and FocusLock auto-focus software integrates patent pending SharpLock Technology to provide an easy-to-use focusing application that functions whenever guiding is active. When using the ONAG On-Axis Guider a cold-mirror r passes infrared light to the guide camera while reflecting visible wavelengths on to the imaging camera. The cold-mirror introduces a slight astigmatism to the guide image allowing FocusLock to quickly determine on which side of focus the camera is currently positioned. The Lacerta add-on kit allows a similar functionality for Lodestar and Lodestar X2 guide cameras. Using the proprietary SharpLock technology, FocusLock can be used to quickly drive the focuser to the optimal focus position and maintain focus for weeks or months at a time. Click the PayPal Buy Now button below to order the Lacerta for Lodestar hardware kit. FocusLock Software is sold separately and may be licensed through PayPal with any credit card. (PayPal accounts are not required). Follow the links below to download and purchase a permanent license. Contact Optec Sales (sales@optecinc.com) or call Toll-Free 1-888-488-0381 with any questions or concerns. Purchase the Lacerta for Lodestar OAG Add-on Kit. FocusLock is licensed software and Lacerta FOAG is patented hardware developed by Optec, Inc. under patent US 9,473,690 B1 held by Innovations Foresight, LLC. NOTE: FocusLock Software is sold separately. Download FocusLock with a 60-day trial license here. View the Lacerta User's Guide and Quick Start in pdf format. Visit our FocusLock Download page to download and try the latest version for 60-days, absolutely free. End your focusing worries and enjoy continuous, perfect focus for months at a time. Full documentation and installation instructions are also available. FocusLock is licensed software developed by Optec, Inc. using patent pending technology from Innovations Foresight, LLC. A software key is required for permanent use. View the FocusLock Quick Start Guide in pdf format. View the FocusLock Help Document online. Download the FocusLock Help Document in pdf format. Innovations Foresight, developers of the ONAG, On-Axis Guider and SharpLock auto-focusing technology. Sky & Telescope magazine review of the ONAG from December 2012. 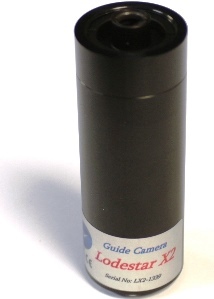 The ONAG provides a new way to guide for astrophotography. Astronomy Technology Today article by Dr. Gaston Baudat describes the ONAG and SharpLock in detail. The TCF-S focuser is a perfect match for FocusLock auto-focusing technology, or use any ASCOM focuser for continuous, automatic focus. FocusLock works very well with QuickSync FTFT digital motors for the Feathertouch family of manual focusers. In fact, any ASCOM focuser can be used successfully with FocusLock. Optec,Inc. © 1996, 2017 | All Rights Reserved.